A 3-bedroom, 3-bathroom condo that sleeps 8 adults comfortably, Pili Mai 8I is the perfect space for your whole ohana. With its spacious interior and lovely plantation-style decor, you'll never want to leave! Cook your meals in the open chef's kitchen and sit down to dinner as a family at the 8-person dining room table. In the evening, catch a movie on the large flat-screen TV in the living room or unwind with a drink on the lanai at sunset. When it's time for bed, the master bedroom has a king-size bed, flat-screen TV, and a spacious en-suite bathroom with a walk-in spa shower. The first guest bedroom has a king-size bed, a flat-screen TV, and an en-suite bathroom, while the second guest room has twin beds (may be converted to King), a flat-screen TV, and shares the home's guest bathroom. For bigger groups, the condo also has a queen-size pull-out couch in the living room. Wikiwiki (hurry) to Hawaii so we can welcome you soon! 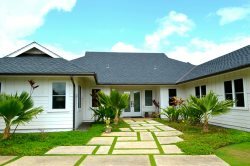 Location, Location, Location: Pili Mai 8I is right near the Kiahuna Golf Course, close to the Pili Mai Community Area and just minutes from shopping, restaurants, and the beach! Pili Mai 8I is a Second Floor Condo on the Second and Third Floors. Wonderful stay, beautiful property, loved the pool and the access to the athletic club. The condo had great central AC, outdoor living spaces and the beds were cozy and there were plenty of pillows, blankets and towels for both the shower and pool. Beach chairs, lotion, shampoo, and conditioner were also provided. Great Vacation Rentals responded very quickly with any questions we had. The property is less than a mile from Poipu Beach and several shopping locations. It's also about 20-30 minutes from the airport, Costco, and a great Safeway. Just an awesome location! We will be back! Review from Airbnb for Pili Mai 8I dated 11/26/18: Wonderful stay, beautiful property, loved the pool and the access to the athletic club. The condo had great central AC, outdoor living spaces and the beds were cozy and there were plenty of pillows, blankets and towels for both the shower and pool. Beach chairs, lotion, shampoo, and conditioner were also provided. Great Vacation Rentals responded very quickly with any questions we had. The property is less than a mile from Poipu Beach and several shopping locations. It's also about 20-30 minutes from the airport, Costco, and a great Safeway. Just an awesome location! We will be back!